I reached Shamrock Park and saw the tip of the bonfire flicker against the setting sun over the swarm of heads. Only a few seconds after the countdown reached zero, followed by a coaxing, “hello!” the lights came on around the tree at the Town Hall. As I walked out of the park past the library I thought of collecting more picture books – like fruit ready to pick were the books on display at eye level just above the shelves in the young children’s aisle. With only minutes till the library’s closing time I swooped over the shelves and gathered nine books and looked forward to a cozy evening on the couch. The first book I picked up was Today is the Day. Disappointing at best. Children in an orphanage wait for their birthday. And enjoy the day filled with visitors, cake and presents when it comes. Many depend on the orphanage to assign their birthday since it may not have been recorded when it happened. Based on an actual orphanage run by a charity, it inspires pity for the children but does not develop them as characters. In refreshing contrast are the orphaned cats who appear in Miss Hazeltine’s Home for Shy and Fearful Cats. Here the most shy and fearful cat turns out to be brave when it counts, leading an effort to save the caretaker and, as a result, all the cats who depend on her. From this I went to the other extreme, a story of a boy as unorphaned as can be, and his family tree on both sides, or actually the male lines leading to his parents. If it were not a fact that he and all the rest of his forefathers were of woman born, there would have been no reason to include them. We don’t hear, therefore, about his mother’s grandparents, or their mothers and grandmothers. We hear of his father, grandfather, great grandfather, great great grandfather … and their wives. On his mother’s side, we hear of her father, grandfather, great-grandfather, great-great-grandfather … and their wives. The notion that one’s great-grandmother, great-great-grandmother and their husbands (or wives) are also part of one’s family is sadly absent. And this too from an author living in a country whose beloved Prime Minister recently answered a question about why he felt it was important to have a cabinet that was gender-balanced, “It’s 2015.” My Family Tree and Me falls far short of the mark. The narrator’s non-white uncle as well as his gay uncle do provide tokens of diversity in the centerfold family portrait in a book that seems to go out of its way to uphold the patriarchal family as if feminism were irrelevant. The next two I read were Happy in Our Skin, which tells us to be as the title says, and Hero Mom, which is a parade of women in the US Military. Both appear to be designed to reassure those who may have had doubts on matters of racial diversity or military mom-liness. Next came Hello World, a thinly plotted story of a monster who gets bored, lost, then found, then bored again. Please Open this Book is one to read for the art and probably for the giggles if you are reading it with the sufficiently young and gullible. The worst of all was The Power of Henry’s Imagination, which is an insult to imagination and its relationship with reality as well as an insult to humanity, as is its parent book The Secret. 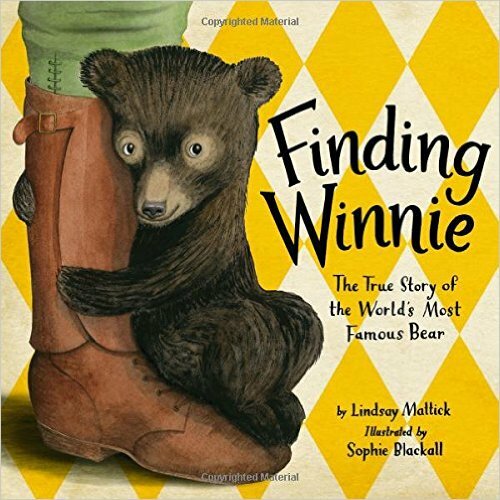 Clear winner of the night was Finding Winnie. So sensitively told at every level. What a book! I’ll be reading this one again and again. What can I say without giving it away? There are so many times I want to recommend picture books because so many parents want to rush into picture-less books the moment their children become fluent readers. The truth is there are so many wonderful picture books that one should not rush through this section of the bookshelves. So rather than waiting to plan a post on selected picture books I decided to write about whatever I happened to find in my five-minute borrowing spree, and here you have it. Lingering question: Why is it that orphaned animals shine through with more character than orphaned children?